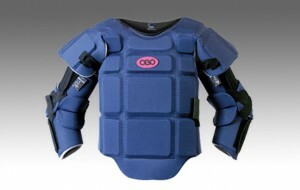 Earlier this season I took ownership of my first set of obo body armour. I have to be honest it was the best money I’ve ever spent. Made from 38 individual pieces of foam (many of which are dual density) this piece of kit is in my opinion among the best in the world. It’s as light as a feather, offers protection similar to that of a nuclear bunker and is as thin as the plot in a Stephen Segal movie. I own the old model. i believe the new model is largely the same. Up until this I had either used some school supplied chest pad and separate arm pads or some low-to-mid range body armour, most of which were pretty poor. I settled on a set of Slazenger Phantom Body Armour which in its defence (even if I will be banned forever for saying this) has served me fantastically for the past three years. However, next season I’ll be moving up a division with my club as well as taking the first team place for my school (here’s hoping anyway) so the Slazenger gear really won’t cut the mustard. Don’t get me wrong, the protection is top notch but it’s bulky…. Really bulky!!! I was also considering “Going Dutch” but since the Slazenger gear came with stitched-on arms it was impossible. So the Slazenger gear had to go. But what to replace it with? Well I toyed with some lower brand gear but I couldn’t find anything to fit as well as the Slazenger stuff (last time mention it I promise). This meant that any time I dived the pads would shift and I’d be left as lame as a duck. Not the metaphorical lame duck either, but a real duck that was actually lame. Maybe from standing on a nail or something. So I decided to go for a top of the range Robo Body Armour (http://www.obo.co.nz/#Products/ROBO/Body%20Armour) and I’ve never looked back. Straight out of the box I was immediately impressed by the quality. It glistened like nose hair after a sneeze. The mesh felt strong and durable and each contour in the dual density foam felt deliberate and perfectly formed. It fit beautifully too, not like the other brands with a million different straps to secure each pad. In fact there are only 5 straps in total yet they can be adjusted to give a perfect fit. The fact that most of these straps are elastic also has a dramatic effect on the flexibility. If anybody is considering loosing the weight of the arm pads I wholeheartedly recommend the Robo chest guard. Not only are you loosing the weight of the arm pads but the chest pad its self weighs less than any other I have found. The dual density is tough as nails offering protection in all the right places like the vital organs. 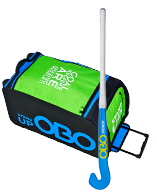 With or without the removable inner soft pad it offers protection which is more than adequate all the way up to (and including) international level. 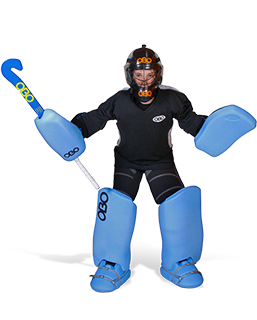 The slim fit also allows you to move and react naturally without having to compensate for the pads. It lasts forever too. Despite the wear and tear of playing on a sand based pitch the signs of this on the chest pad are minimal. Just some minor fraying edges on some of the mesh which I’ve repaired using material from an old smock (actually that’s a tip worth remembering). Such little wear after spending nearly a whole year sliding around on a sand filled pitch leads me to believe that if proper care is taken these pads could last forever. I have been told that I play with a slightly unusual style just doing whatever feels natural to get the ball away quickly. Since I’ve been using the Robo chest pad I’ve had the option of controlling the ball on my chest at my disposal. Several times this season I’ve been in the situation where the ball has been flicked across the D and my only options were to take it on my chest or deflect it straight into the path of an oncoming forward. In the past I would have just gone with the latter and hope for the best but with this new gear I can take the ball on my chest and have it drop perfectly to clear with my kicker. 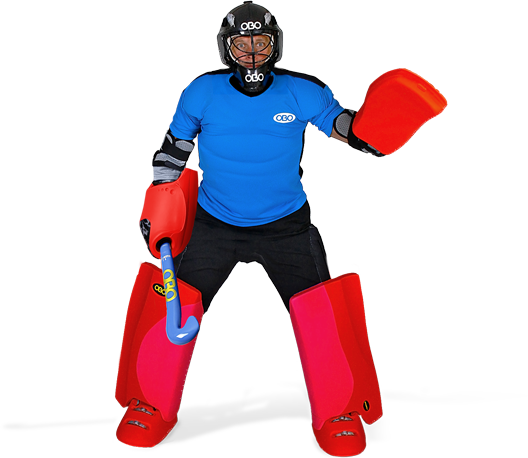 Without compromising protection the thin design lets you feel the ball on your chest meaning you don’t end up with that numb feeling that comes with the spongier gear. And it no longer hurts the way your tongue hurts when you accidentally staple it to the wall. While this has only happened a hand full of times this year that’s still five or six scoring opportunities that they’ve prevented this season. Now I know that style isn’t meant to be important to a goalie but let’s face it, all keepers like to look unique. With most of the bulkier chest guards I used to find myself limited to the single tone smocks that most manufacturers offer.  While I know that OBO offer a fairly decent selection of colours but if I’m just buying the best one I can find then surely hundreds of other keepers will do the same. 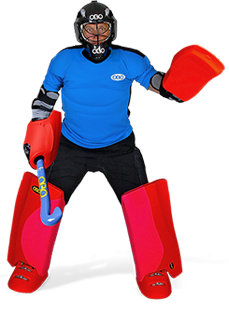 With the slim line nature of the ROBO chest guard, however, I have found that I can wear almost any regular t-shirt I can find over my pads. This truly offers a unique selection of styles to choose from. When it comes to chest pads there’s a huge variety to choose from. 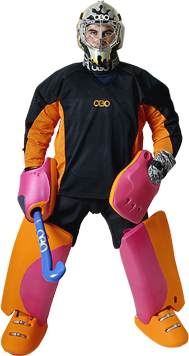 I believe that I have sampled a decent cross section of these (including being sponsored by gryphon for a time but that never felt right for me) and can proudly say that I would recommend the Robo Body Armour or Chest Guard to any keeper who wants to perform at their personal best. The design is simple, like my brother Phill but unlike Phill this design works. It is usable by all and from what I have heard from my fellow keepers there have been no complaints. If you have any questions feel free to leave comments and I’ll get back to next time I’m online. nah the Robo's a million times better. and there're prob plenty of other kits that are better than the slazenger one too. it's just been the best budget gear i've found. i'm doing exams this week but i'll get a review on the slazenger gear up next week if you want. Up to you; it may be useful for someone looking for some budget gear. I agree with this completely but one bit of feed back to OBO is Women have different upper body shapes to men and i still get hurt when I'm hit on the chest and my chest protector tends to sit away from my abdomen I appreciate that making a women's chest guard would be difficult, but could a inset or extra padding be available for it to fit better or at least prevent me getting a bruised chest?